My name is Jennifer Shearer (although some of you may know me as Jenna Shear), and I’m one of those “Camp Kids” who’s been lucky enough to attend Camp more times than I can remember. I’m helping out with the EEFC’s Social Media presence and wanted to highlight some of the quickest, easiest, and 100% free ways to support our amazing community. Like, comment, or better yet, SHARE our posts on Facebook! Facebook decides which posts are “important” based on how many people interact with our work via “likes,” comments, and “shares.” In other words, engaging with our posts through the simple click of a button will drastically increase how many people see our posts and how many new potential campers we can contact. A “like” tells Facebook that we’re important. A comment carries about the same weight as a “like” according to Facebook’s algorithms. However, a “share” is weighted differently. A “share” will post our post to your profile. You’ll have the option to write some commentary about the post, or you can just share it as is. Facebook prefers “shares” to “likes” and comments, so if we’re featuring a teacher or event you love, please use the “share” option to really show us how much you care. If you scroll down on our Facebook page, you’ll notice a section for reviews in the lefthand column. Please write us a little testimonial! Again, this tells Facebook that we’re popular and important and is another item that potential campers take into consideration when deciding how to spend their money. Camp is wonderful, so we’re sure you’ll have plenty to talk about. High fives to those who have already written reviews! 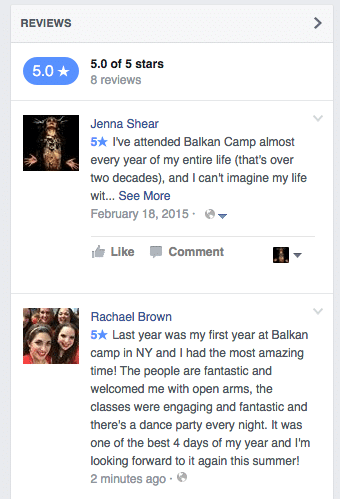 Tag us in your posts about Camp and use #balkancamp2016. Tagging and hashtags are clickable links that build a web of connections between posts. This web helps Facebook understand what is important to you and who else might be interested in it. 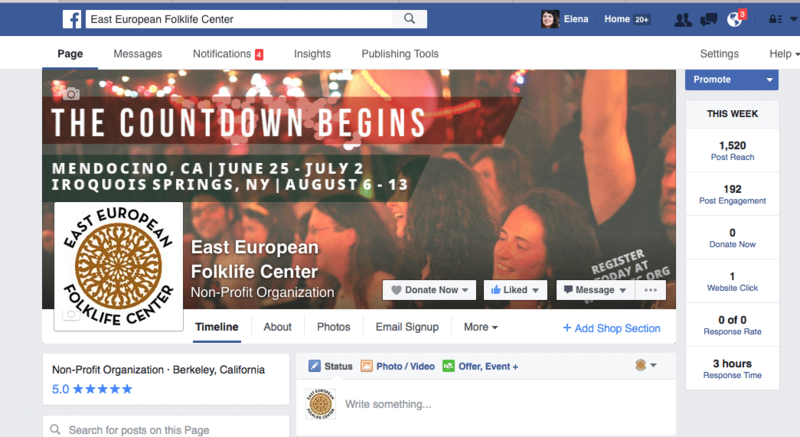 A tag for the EEFC will link people directly to our Facebook page. A hashtag will link you to a list of posts that include the same hashtag. Last year, we had great success with our hashtag trial run at Iroquois Springs, and this year we’d like to take it even further. It’s most helpful to us if you lessen the privacy settings on the posts you’re hoping to share with the community via tags and hashtags. Here’s a How-To for tagging pages on Facebook. Type last year’s hashtag into Facebook’s search bar at the very top of your screen to enjoy memories from last year! Did one of your friends “like” a post you shared from the EEFC’s page? Send them an email to follow up on their interest, or better yet, bring up Camp the next time you see each other. Social Media has its place, but nothing beats word of mouth and that personal touch. If you’ve made it this far, please give yourself a big pat on the back. That was a lot of information! If you need clarification on any of the above points, I’m happy to help, and if you have ideas or want to volunteer, I’ll connect you with the right people. Thank you so much for reading, and long live the EEFC! Editors note: it is with immense gratitude that we thank Jenna for providing this easy to understand guide to promoting the EEFC on Facebook. Now all we need to do is get out there and do it!!! !